The people of Lagos would have been the victims of this eleventh hour crusade against the governor. It is now time for the numerous stalled projects in Lagos state to be given the much needed attention that will crown this welcome resolution and ensure an enduring legacy for the governor. Lagos is a cosmopolitan State where indigenes from different parts of the country live and converge to do business. Governing such a state requires some deft political moves, and the ability to read the mood of the populace. In the last three-and-a-half years, Governor Akinwunmi Ambode has shown that he possesses the wherewithal to engender good governance in such a highly cosmopolitan but volatile state, and his performance has endeared him to the hearts of Lagosians. It is not a secret that there has been rancour between the governor and major stakeholders of the All Progressives Congress (APC), on which platform he became governor in 2015. Particularly, the strife had pitched him against his estranged godfather, Asiwaju Bola Ahmed Tinubu (a.k.a BAT), who single-handedly ensured that Ambode became governor of Lagos State after Babatunde Raji Fashola. The seeming disconnect between Ambode and APC stalwarts has manifested in different ways in the State. On his assumption of office three years ago, he embarked on an ambitious project of delivering road networks, mostly in the nooks and crannies of the State. He also ensured adequate security by re-invigorating the State’s security outfit, the Rapid Response Squad, and securing the waterways through which some hoodlums and armed robbers had attacked banks in the busy Victoria Island and Ikoyi environs. To further ensure the safety of Lagosians, he embarked on the clearing of notorious slums and shanties in Oshodi, by removing the makeshift shops that sometimes served as hiding places for criminals. In place of this, Ambode is replacing the shanties with a modern market which meets international standards and which will transform the area. However, Ambode’s success so far has not gone without its own pains. His government has engaged in tussles with traders in the Ladipo area of Lagos, which has led to the closure and re-opening of the market there on several occasions. The governor is concerned that the traders are not complying with sanitation rules or taking adequate steps to protect the health and safety of Lagosians. His ban on okadas on major roads has also been met with groans by people engaged in the transport business. About a million or so people are affected. Many of them took up okada riding due to the hardship experienced after losing jobs or being unable to find other jobs. It is a known fact that some inner roads in the State have been unmotorable, so okada is an alternative for many people. In addition, it has the advantage of helping to beat the notorious Lagos traffic. The governor’s attempts to clear Lagos roads of street traders has also not yielded results, as street traders are ubiquitously found everywhere, chasing after motorists on major roads in the metropolis. Side-by-side with the street petty traders are the pick-pockets who have defied every measure put in place to clear them off the roads. They all take advantage of the bad roads, especially in the raining season where the rains cause more traffic on major roads in the State. On a general scale, Ambode is seen to be carrying out a facelift of Lagos, with transformations like the Iganmu-Badagry ten-lane expressway, the Oshodi-Abule Egba BRT lane and the Oshodi-Lagos International Airport road, all of which are still under construction. The fortune of the ongoing construction of these roads took a nose dive during and shortly after the clash between the governor and major stakeholders in the APC last year. In particular, his deteriorating relationship with BAT, who plays a larger fatherly role in APC, has proven to be the bane of his stewardship in recent months. The relationship between Ambode and his political father is said to have degenerated to a point that BAT thought Ambode could not continue to govern Lagos for the next four years. In the first instance, Ambode was said to have allowed the gulf between him and his godfather to widen, due to his sudden taciturnity. It was not always so. Right from when it was first announced that he would take over from the former governor, Babatunde Fashola, the stakeholders said he was relatively unknown, besides being a former accountant in the Lagos State civil service. But BAT continued to assure the others until he was accepted, to the chagrin of Fashola. However, no sooner had he been appointed than he began to fence out some people. He did away with Fashola’s appointees, while gradually distancing himself from BAT. His relationship with the speaker of the Lagos State House of Assembly, Mudashiru Obasa, has also not been very rosy. Even his own appointees found it difficult to reach him, as he would not pick their calls. BAT was not left out of the cold treatment, as Ambode ignored his calls or refused to return them. This was why Lagos stakeholders supplanted him with Babajide Sanwo-olu. The move to replace Ambode with Sanwo-olu caused rupture in Lagos. All entreaties to BAT by different people, including the president, fell on deaf ears. At the end, Ambode, in a display of poor political brinksmanship, decided to contest face-to-face with Sanwo-olu, despite advice and warnings from those who should know better. The contest was held and he was woefully defeated. Although he claimed the contest was rigged against him, Lagos State APC stakeholders ignored his claims as they wanted him out at all costs. The last straw that almost broke the camel’s back and which threatened Ambode’s substantive position as governor is said to be his open confrontation with the Lagos State House of Assembly on the presentation of the 2019 budget. Ambode is said to have merely sent a copy of the 2019 budget to the House in December, without going to present it formally at the House. He is also said to have by-passed the Lagos State Assembly in a new spending spree, although he claimed he had acted within the law. His claims notwithstanding, the lawmakers responded by threatening impeachment. 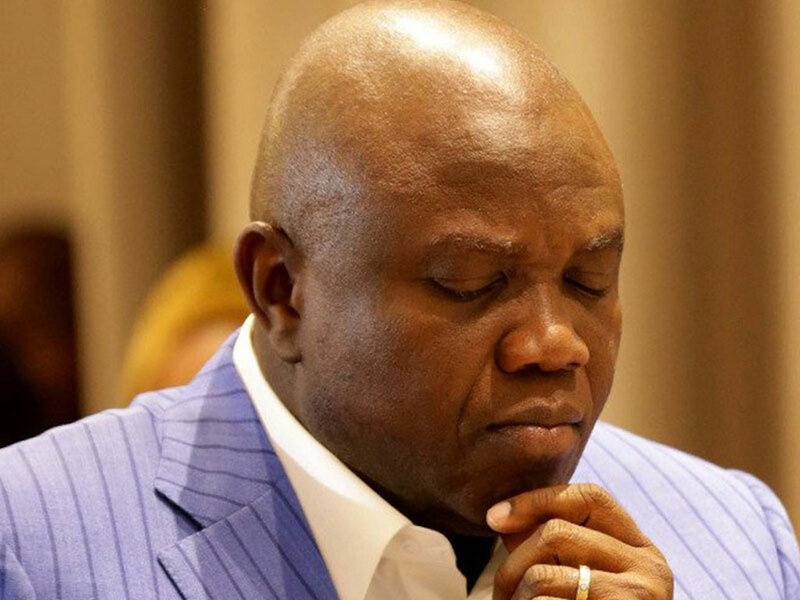 Ambode turned a deaf ear to all entreaties to soft pedal. For example, he ignored advise for him to seek the intervention of notable people outside the government, including the founder of the Redeemed Christian Church of God, Pastor E. A. Adeboye. He is rumoured to be holed up in his office, without speaking with his own associates. Some rumour peddlers even say he has been engaging in anti-party activities, to the extent of hobnobbing with Jimi Agbaje, the governorship aspirant of the Peoples Democratic Party (PDP), and financing his bid to run in Lagos. The Lagos Assembly members picked up on the rumours by claiming that if the budget is passed, they are not sure Ambode would not deploy Lagos’ funds to cater for the opposition. Despite the allegations, Ambode remained defiant, believing himself to be right. There were claims from some quarters that the assembly members were only desperate to find a way to fund their individual campaign expenses. Also, the assembly members had been accused by a non-governmental organisation of misappropriation of N28.8 billion as the running cost of the house, while threatening the governor with impeachment. Just as the battle line was being drawn in the sand between Ambode and the Lagos Assembly members, BAT and the APC leadership in Lagos quickly intervened and later publicly declared that there will be no impeachment for the embattled governor, and that all issues had been resolved. The resolution seems like the lull that Lagosians have been praying for in the gathering political storm in the state. The people of Lagos would have been the victims of this eleventh hour crusade against the governor. It is now time for the numerous stalled projects in Lagos State to be given the much needed attention that will crown this welcome resolution and ensure an enduring legacy for the governor. With his track record in office as governor, it is a pity that Ambode was caught in a web of conspiracy. One also hopes that Ambode and BAT are getting nearer to true reconciliation, because the performing governor can still be useful to APC in the future.